For a lot of Star Wars fans that were unlucky enough to be born after the original trilogy had its theatrical run, there was never an opportunity to see the movies in their natural state. In the 90s, George Lucas made the now lambasted decision to alter the movies and “modernize” them. Scenes were changed, effects were added, and a lot of the charm the admittedly dated special effects brought to the table was removed. Unfortunately, because of these “specialized” releases, those of us born post-1983 would never get to see the same movies our parents and older relatives did; we would be forever forced to watch these new versions. However, one fan was brave enough to step up to the plate and change this. 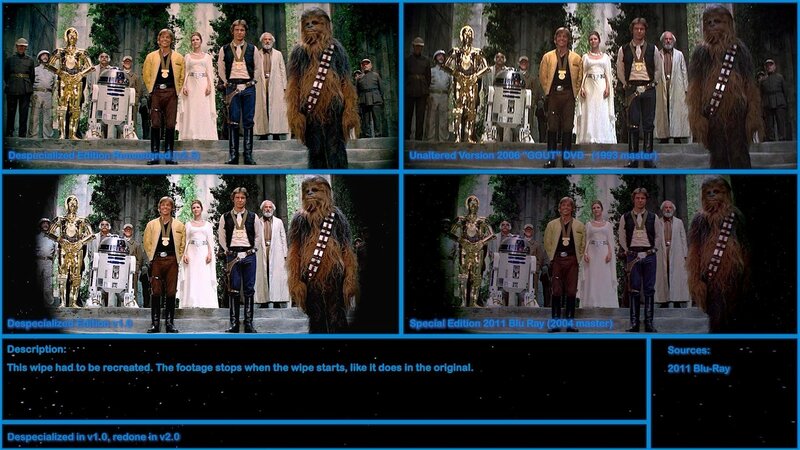 Petr “Harmy” Harmáček took it upon himself to digitally restore the untouched, “Han shot first” versions of the three movies in HD so the next generation of Star Wars fan can watch and experience the same films that launched Star Wars into pop culture history. Comics & Gaming Magazine: Can you tell us a bit about yourself? What’s your background in film and are you involved in digital restoration and film outside of this project? Petr Harmáček: I come from the Czech Republic, a post-communist country in Central Europe. 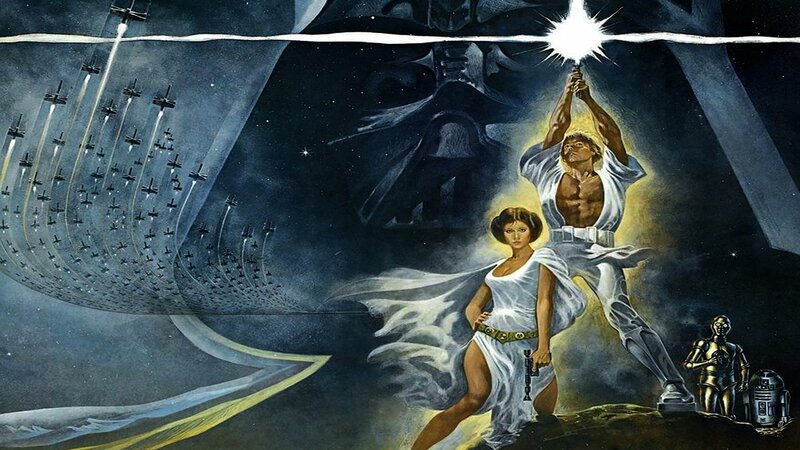 I was born one year before the dissolution of the Eastern Bloc, so I grew up in democracy and with it came many Hollywood blockbusters, which had been forbidden under the communist regime, including Star Wars, so in my country I’m part of the original generation of Star Wars fans. I studied English Teaching at the University of West Bohemia, so I have no educational background in movies but I have always been an avid movie fan and I started my work on Star Wars as a hobby and I learned everything from scratch from online tutorials and such, and my skills improved with each new version and now I actually do have a job in the field thanks to it. The work I do for Ultraflix is actually right down my alley—most of the work I did for Star Wars was trying to improve lower quality footage and what I do for Ultraflix is preparing movies for UHD digital streaming on the Ultraflix service—the masters that the studios give us, especially for older titles, are often in need of some cleanup and colour correction, so we remaster them for Ultraflix to make sure they compress smoothly and bring our customers the UHD experience they are looking for. But as a proud member of Nanotech’s 4K Studios team, I also work on external projects, like cleaning and improving the quality of archival footage for documentary films—for example 4K Studios recently did 4K Mastering for a wonderful documentary called “Winning: The Racing Life of Paul Newman” and I was in charge of the archival footage cleanup. CGM: How long have you been a Star Wars fan? What was the first experience that caused you to fall in love with the series? PH: I’ve never had a chance to see the original SW in the cinema but I remember seeing Star Wars on TV when I was about 5. I have a distinct visual recollection of seeing the trench run on TV but I must have seen the whole movie, because I remember playing Star Wars with my friends afterwards, though we didn’t remember the names of the characters and would just call them The Boy, The Man, The Girl, The Hairy one, The Old Man and The Black One. We had some epic lightsaber battles though. PH: When I got a little older, I really enjoyed various behind-the-scenes documentaries and the type I enjoyed the most were documentaries about how visual effects were made. At the time I was growing up, digital effects were already quite common but I was completely fascinated by how they made these amazing effects before they had CGI. But at that point I only owned the Special Editions of Star Wars and I really wanted to see the original effects, so I was after the original versions even as a kid. And then, when HD came around, as a film buff, I naturally got really into it and I wanted to see my favorite films in HD without all the additions I didn’t like. CGM: What were your goals setting out on this project and how did they evolve during the process? What were or are the most important aspects of the movies for you? PH: Well, the first version I made was called the Partly Despecialized Edition, where I removed only the changes I considered most offensive, so that I could at least enjoy watching the film without cringing but the only reason this version got made was because I didn’t have the skills yet to remove all the changes. While working on those, I learned so many new tricks that I decided to start over, this time with the goal to remove as many changes as possible without compromising the visual quality too much. And because again, doing this, I learned new skills, but also because other fans were also relentlessly working towards the goal of preserving the original versions and so new, better sources became available, I made a few more updated versions, but always with that same goal—to improve the visual quality, while removing even more changes. CGM: How long did the process take? PH: All-in-all, about five years and it’s still not over. CGM: Can you describe the steps involved (be as technical as you feel you need to be)? 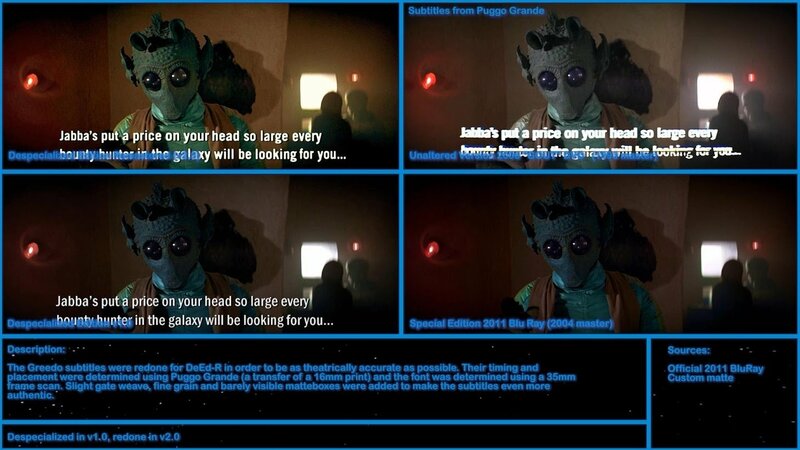 PH: I took the HD special edition footage available through Blu-Ray and HDTV broadcasts and I replaced the changed parts with the best quality sources I could find. Where possible, I didn’t replace whole shots, because the materials available for the unaltered original are of such poor quality that you can’t just put them inside an HD video and not make it look completely jarring, so where only smaller changes were made, I would replace only a small area of the image with the lower quality source. I had to restore and clean some 35mm footage using various techniques from doing some automated cleanup in a free command-line-based program called Avisynth, to doing meticulous manual cleanup of dirt and scratches in After Effects and some of the reels were also severely pink-faded, so I had to pull out the original colours. 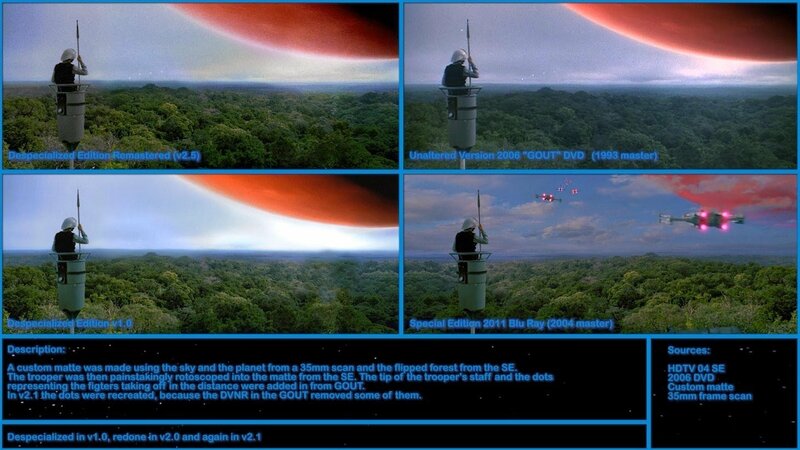 But most of the work I did was actually more in the visual effects compositing field than what a restorationist typically does, because I had to use the low quality DVDs and film scans to essentially paint out the CGI additions made to the films. CGM: Are you ok with people pirating your versions? Are you looking for some kind of compensation for your hard work? How has the response been? Did you expect it would gain the traction it did? What’s been the biggest moment for you? PH: I never expected to be compensated for this work in any way but in the end, I’m compensated plenty—by the joy of reading all the positive comments but also by scoring my dream job with Nanotech Entertainment’s 4K Studios. I started working on it as a little personal project, which I was going to share with a few friends I made online at originaltrilogy.com, and I never expected it to become as huge as it now has. I get mostly very positive reactions—it always warms my heart when someone tells me what an emotional experience it was for them to see the original in all its glory again. CGM: Are you excited for The Force Awakens? 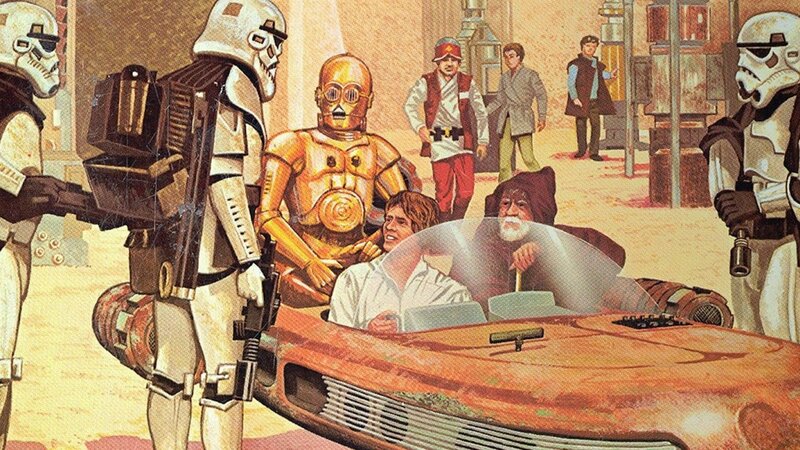 Do you think this will be a return to form for the Star Wars universe? PH: From what I’ve seen so far, I’m cautiously optimistic—I think it could be a good movie. I don’t think it will be as good as the original trilogy, because visually it looks like every other big blockbuster today and what little was revealed of the story didn’t manage to get me excited either, but I’d love nothing better than to be pleasantly surprised. Thanks a lot Petr, may the force be with you!